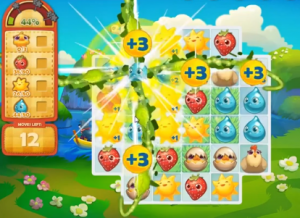 These Farm Heroes level 202 cheats and tips will help you beat level 202 of Farm Heroes. 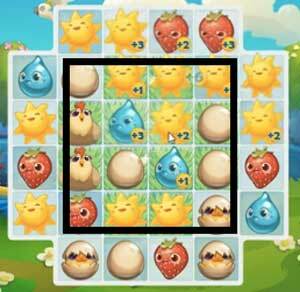 The objective of Farm Heroes level 202 is to collect 3 chicks and collect 80 strawberries, droplets, and suns You will only have 18 moves to complete these tasks. First things first: Hatch some eggs and collect some chicks. As you can see you have chickens scattered on the board. Create a match alongside them and they will lay an egg. Try and make sure the match you use counts towards your suns and droplets. Once they lay and egg, create a match of 3 to make 1 broken egg.Once you have 3 broken eggs, match them to collect 1 chick. This can be quite difficult, so make sure you focus you early attention and moves on this task. If you are having trouble matching eggs, a good trick is to use the shovel booster on an egg at any stage to advance it one stage. For example, if you have two cracked eggs and an uncracked egg in a row, you can use the shovel to crack the third egg and make a match for a chick. Shovels are sparse, however, so only use them when you really need to! 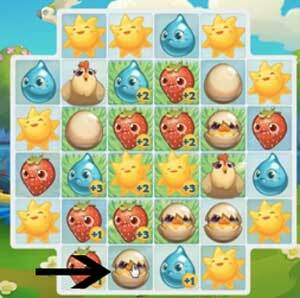 The best part of level 202 of Farm Heroes Saga is the large patch over grass covering 12 squares. Try and keep the majority of your moves here. Making matches of suns and droplets will result in bonus points for those needed cropsies. Matching cropsies of higher values will save you moves by fulfilling your objectives faster. You should also try and avoid wasting moves on cropsies you don’t need. Keep an eye out for cropsies that aren’t essential to the level’s objective. You need to collect 80 of each cropsie and you only have 18 moves, which sounds quite difficult. Try to make matches of 4 or more cropsies. This will give you bonus points on all surrounding cropsies. Matching these cropsies will give you additional collected points toward your objective. If you use the large matches of cropsies and the large patch of grass to your advantage, you should have no issue collecting 80 of each kind. This will fulfill your objectives more quickly and save you moves.